The Story: ‘Two Worlds Collide’ is an over under photo captured of a vivid sunrise at Hyams Beach, Jervis Bay. Above the water is clouds in the sky bursting to life with colour from the rising sun. 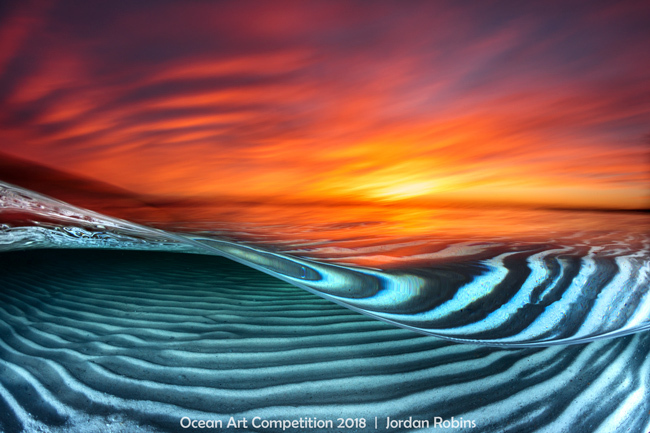 Below the water is a series of parallel lines of sand formed by the continual rise and fall of the ocean.This photo took nearly six months to capture with multiple failed attempts along the way. I wanted to capture vivid colours in the sky contrasted with the crystal-clear water and unique formations in the sand below the water’s surface. On this particular morning, I was rewarded with an amazing sunrise and crystal clear calm water.I used my two inon-z240 strobes to light up below the water and balance the exposure with the sky. During post processing I added a little bit of blue to the water to create a dynamic contrast with the fiery reds in the sky, creating an almost psychedelic like scene.